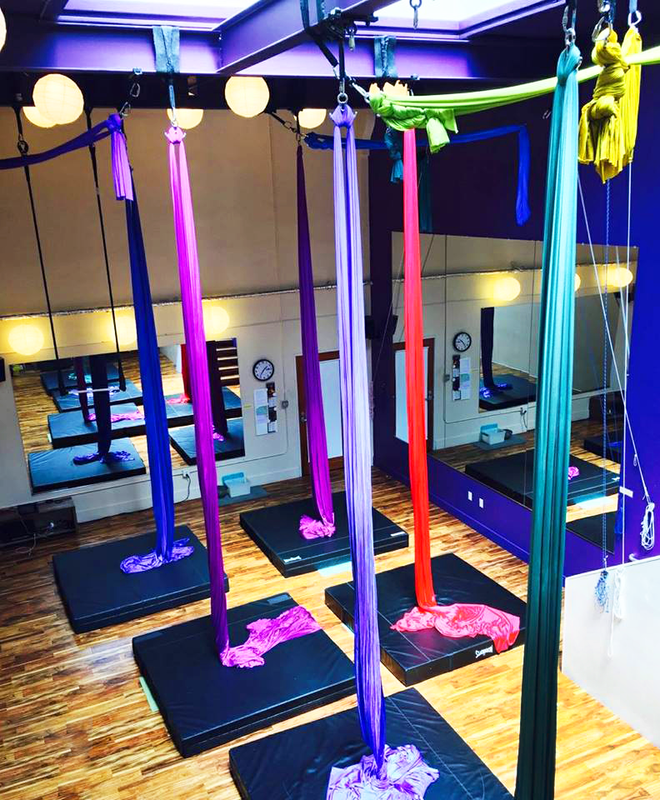 Night Flight offers adult (ages 16 and up) aerial Drop-in classes in stretching and aerial arts in Portland, OR. Our Drop-in classes are way for students to try out aerial before committing to a Series class. Our Drop-in Classes fill up quickly. Sign-up online to join! 1.5 hours. Students work on both silks and trapeze in this Drop-in class. This class is suitable for students enrolled in our Beg Aerial 1 & 2 Series as well as students who are brand new to aerial. Class time breaks down to 30 min warm up, 30 min on the silks and 30 min on the trapeze. 1.5 hours. Our Stretching Drop-in focuses on deeper stretching and active flexibility. Suitable for all levels. This is a 1.5 hour class. Come have fun, get stronger, and feel more confident in the air! Our Conditioning Drop-in class focuses on strength building rather than new tricks. Includes conditioning in the air on a variety of equipment and on the floor. We are so excited to get pumped with you! Prerequisites: Students currently enrolled in or completed Beginning Aerial 1, and be able to climb the silks. 1.5 hours. This mixed level (int to adv) Silks Drop-in is suitable for students who have completed our Beg Aerial 1 & 2 Series. Students should be comfortable climbing, straddling up in the air and demonstrating the following sequence: single footlock, devil stag, hiplock, back balance, catchers to attend. 1.5 hours. This mixed level (int to adv) Trapeze Drop-in is suitable for students who have completed our Beg Aerial 1 & 2 Series. Students should be comfortable with fly, straddle and knee beats, a pullover on our medium bar (it doesn’t need to be perfect), an ankle hang, our bird’s nest sequence and a Montreal without help to attend to attend. Our Open Gym is tailored to our intermediate and advanced aerial students. Students must have instructor permission for Open Gym as well as pass our fitness test. If you are visiting from out of town, please take a look at our Visiting Students page. While we understand that there are many circumstances that may lead to being late, we cannot allow a student to participate in a class if they are more than 15 min late. No one is allowed on the equipment without an instructor’s supervision. Students are not allowed in class if they are under the influence of drugs or alcohol. If they do they will be asked to leave. Students can only work on material the teacher is covering in classes. If a student wants to work on other material they must get instructor permission. Use of safety mats is required under aerial equipment. Do not touch the mirrors. Do not kick up into handstands against the mirrors. Please pick up after yourself and put equipment (blocks, bands, ab wheel, etc.) back where it belongs after using it. No chewing gum while on the equipment. Don’t move rosin/chalk containers. Apply rosin/chalk over container. No jewelry, zippers or buckles on the equipment. Please double check running/yoga pants for zippers. If a small zipper is found use athletic tape to cover the zipper. They catch on/tear aerial fabric and can be dangerous to the student. No jeans. Please be considerate of your instructors and other students and come to class clean, wear deodorant and fresh workout clothes. No street shoes in the studio. Students may go barefoot, wear socks or ballet shoes. Please have clean feet and/or clean socks. Please do not come to class if you are sick. Please cover open wounds and warts with a band-aid and tape. If the injury is on your foot please wear socks. No videoing instructors. Students can photograph/video each other with permission. Students will not be allowed into class if they are more then 15 minutes late. The studio will be closed on Thursday, July 4th. Please Note: Cancellations for Drop-in classes/Open Gyms must be made 18 hours in advance in order to get a Drop-in class credit returned to your account. If you would like to request a refund for a Drop-in class purchase, please email nightflightaerial@yahoo.com. There is no option to get a refund through Mindbody. In Mindbody, click on the “My Info” tab. Find the date of the Drop-in class/Open Gym you want to cancel. Click on the “Cancel” option on the right side of the table. You have now cancelled yourself out of the Drop-in class/Open Gym and the Drop-in class credit has been returned to your account.